Heel spurs are a common, painful foot condition that hundreds of thousands of Canadians suffer from every year. Fortunately, most people experience relief from effective and affordable treatment plans. 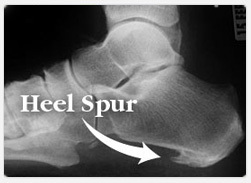 A heel spur is a small, bony growth on the heel bone (medically referred to as the calcaneus). Interestingly enough, heel spurs are not actually the source of your pain and rather it is the inflamed tissue surrounding the spur that causes discomfort. Heel spurs are typically the most painful in the morning as you take your very first steps out of bed. Most people experience a sharp, stabbing pain in the bottom or front of the heel bone that gradually diminishes into a dull ache as the day goes on. But after long periods of sitting or lying down, the piercing pain returns. Heel spurs develop because of a condition referred to as Plantar Fasciitis (Latin for “inflammation of the Plantar Fascia”). The Plantar Fascia is a flat band of tissue that runs from your toes to your heel bone underneath your foot. When it functions properly, this tissue is flexible and strong, supporting your arch. In other cases, the Plantar Fascia is excessively stretched causing micro-tears in the tissue to occur, which leads to irritation and inflammation where the Plantar Fascia attaches to the heel bone. Weight gain, high stress, old age and poor foot function are just a few of the most common contributory factors. The constant pulling action is what eventually causes the development of a bony growth, called a heel spur. During long periods of rest (while you’re sitting down, driving or sleeping), the Plantar Fascia shortens and tightens. When you get up, all of your body weight is applied to your feet and your Plantar Fascia is forced to stretch and lengthen in a single instant, causing irritation and micro-tearing. This is the sharp pain you feel. Am I Prone to Developing Heel Spurs? Rest. Give your body a chance to heal the inflamed area of your foot. Avoid prolonged physical activity, standing on hard surfaces, walking, running and impact sports. Ice. Apply ice to the affected area for 5 minutes two to three times daily to decrease inflammation and reduce pain. Lose weight. Remember, your feet are forced to bear all of your body weight. Make sure you maintain a healthy weight to reduce this burden. Stretch. Click here to view a targeted stretching program specifically designed for those suffering from heel spurs. Get orthotics. Address the fundamental cause of heel spurs: the biomechanics of your foot. Orthotic insoles tackle the root cause of the problem. Their special configuration works to correct the abnormal mechanics of your foot. Footlogics orthotics were developed by Australian podiatrists and are designed to support the arches of your feet and control over-pronation. These corrections help to release the tension on the Plantar Fascia to effectively treat the condition. Footlogics orthotics for heel spurs also have a shock-absorbing heel pad that reduces impact for added comfort and pain relief.